I can't (or maybe don't want to) remember the last time I was so personally mortified and simultaneously thrilled. Thanks, Pseu, for bringing this to our attention! And great big thanks to Joe Belock for securing the interview with jinglemeister supreme Parry Gripp! This is a perfect example of what advertising music could be, but almost always isn't..
What would you eat, if you came to the 'fest? Would it be salami, or bologna with cheese? are these the CDs that Philly Boy Roy was sticking in each Hoagie he served at Wawa? You're still the man Gaylord. Wow these posts are fantastic. Very hot! But now I'll have to sue you for spilling it on my brain. Was a rewrite of George's "Wah-Wah" ever in the cards? Maybe the execs at Wawa Inc. realized that "And I know how sweet life can be if I keep myself free of wah-wah, I dont need no wah-wah" wouldn't lure potential customers in for Shortis. Episode 36, titled 'Hoagiefest', Features Stone Temple Pilots, and my personal favorite, MICHAEL MCDONALD and the Hoagie Brothers!!! 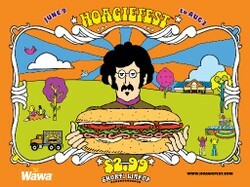 I grew up with a Nazz track called Loosen Up which had the line "...home of the tuna fish hoagie". Now, being from Australia I had no idea what a 'hoagie' was...until...I was in Philly in '92 and realised, oh, a 'bun', a 'roll', what some call a 'sub'. Now, being the record nerd, I was very thrilled to go into a local shop and ask for a Tuna Fish Hoagie. The joy I had eating that one!